It all starts with the hosts. Once they’ve filled out an application and have been vetted and approved, they have creative control on the DinDin Party they want to create. They then can fill out their DinDin Party listing. It can be all about the food, focused on fun and games, or a combination of both. It can be a themed party, a gourmet meal, a cooking class and dinner, an evening of entertainment and music with scrumptious appetizers. There’s no limit to the creativity a host can bring to their DinDin Party. Here are the steps that happen in the DinDin Party process from beginning to end. 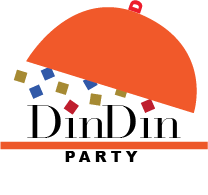 Host creates the DinDin Party menu, plans any activity or entertainment, and sets the date, time, place and price per guest and submits it to DinDin Party. Their DinDin Party is listed on dindinparty.com website. Guests or the public at large search for DinDin Party events by date, location, cuisine, type of entertainment. Guest finds a DinDin Party they like and requests to book a seat(s) at DinDin Party event and enters their credit card. Host and guest can interact through private messaging service to ask/answer any questions. Once Host approves guest, guest credit card gets billed. At specific date and time, Guest meets at the Host’s home (or other designated location) for a social and dining experience like no other! Afterwards, Guests review Hosts and Host can review Guests. Two working days after their DinDin Party, Hosts get paid the price the guest paid for the seat minus 20% booking fee.